AIOs incorporate a waterproof or water-resistant outer layer with absorbent layers and usually a feel-dry layer toward the skin. The general shape of AIOs tends to be the same as pocket diapers, in an hourglass shape. Because there is no need to stuff after washing, AIOs are extremely convenient to use, just like a disposable diaper. Since there is no way to increase the absorbency of the diaper itself, the only way to add absorbency is to lay a "booster" that has another feel-dry layer on top of the diaper for nighttime use. Like pocket diapers, AIOs cannot be pulled on and off over the feet. AIOs also have the same fit limitations as pocket diapers, with leg elastic being pulled tightly around the circumference of the thigh in order to provide adequate leak-resistance. Because the absorbent layers are hidden inside the diaper, wash water cannot circulate freely throughout all of the layers of the diaper, so it can be more challenging to get them clean at each wash. AIOs tend to be just as bulky as pocket diapers, with the same difficulty fitting them under famous-maker clothing. 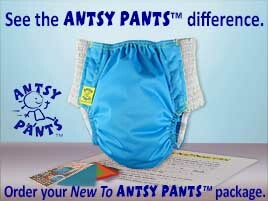 So how do Antsy Pants™ compare to AIO diapers? Antsy Pants ™ combine AIOs' ease of use with better washability, the ability to modify absorbency within the diaper and pull-up functionality that is great for toddlers. Antsy Pants™ are AIOs for day-time, but incorporate a pocket so its easy to make them more absorbent for a heavy wetter, for longer wear-time, or for nighttime use.